"This is a family favorite...spinach, fresh mushrooms, artichokes and cheeses make up a mouth-watering side dish that is creamy and delicious. This recipe has a lot of steps, but it is relatively easy and is well worth it. If you are a garlic lover, add an additional clove or two of pressed garlic to the mixture without roasting it first. This is my most requested vegetable casserole recipe, and it is a Thanksgiving favorite." Place garlic cloves in a small oven-safe dish, and roast in the preheated oven until softened and fragrant, about 20 minutes. Set roasted garlic cloves aside to cool. Place the spinach in a large mixing bowl, and stir in the artichoke hearts. Melt butter in a skillet over medium heat, and cook and stir the mushrooms until softened, about 10 minutes. Mix in the green onions, and cook and stir until onions are soft, about 5 more minutes. Transfer the mushrooms, green onions, and butter from the skillet into the bowl with spinach mixture. Remove cream cheese from wrapping, place into a microwave-safe bowl, and cook in the microwave until warm and very soft, about 1 1/2 minutes. 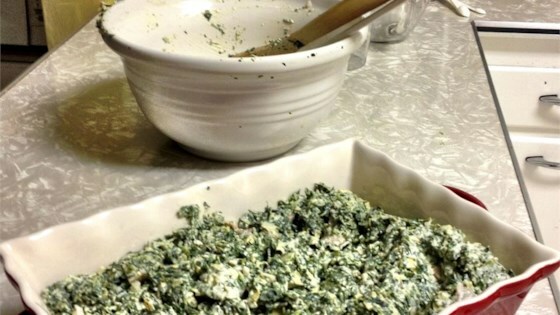 Stir the softened cream cheese into the spinach mixture, and add the sour cream, water chestnuts, Parmesan cheese, mayonnaise, garlic salt, and lemon juice. Squeeze the roasted garlic out of the garlic skins, and mix thoroughly into the spinach mixture. Spoon the casserole into a round 2-quart baking dish. Bake in the preheated oven until the casserole is hot and bubbly, about 30 minutes. Spread French-fried onion rings over the top, return to the oven, and bake until the onion rings are lightly browned, 5 to 10 more minutes. I made the low fat version recommended in the reviews and it was spectacular. Everybody loved it so much that there were no leftovers! This is an absolutely delicious casserole. My family loved it. Usually, I can't get my children to eat vegetables, but they cleaned their plates with this one. It will be a family favorite! By far the best vegetable casserole I have ever tried. If you want to wow your guests, make this one.